MODESTO, CA. 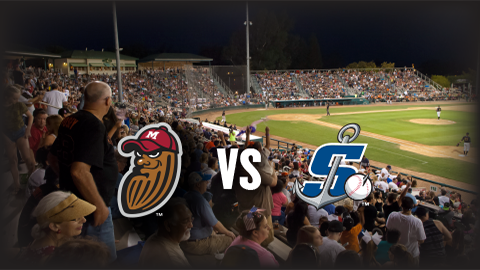 - Two seventh-inning runs broke up a pitcher's duel as the Modesto Nuts fell 2-0 against the Stockton Ports on Saturday night at John Thurman Field. In the Nuts' sixth straight loss, Ray Kerr started the game and threw well for Modesto. He retired the first six batters and only surrendered a bunt single in the third. In the fourth inning, Kerr was able to strand a pair of two-out infield singles. He was done after 4.1 innings allowing just three hits, none of which left the infield, while striking out three and walking one. On the other side, Xavier Altamirano (W, 1-1) walked only one in the first five innings of his start for the Ports (4-6). Carrying a no-hitter into the sixth inning, Johnny Adams rolled a groundball deep into the hole at shortstop. Nick Allen fielded the ball cleanly but the throw was late. The infield single by Adams was the only hit for the Nuts all night. Altamirano worked six innings and struck out six with one walk. The Ports got the only runs of the game in the seventh inning. Jordan Devencenzi singled to start the inning against Scott Boches (L, 0-1). Allen sacrificed him to second before Boches recorded a strikeout for the second out of the inning. Austin Beck followed and hit a line drive toward the alley in right-center field. Anthony Jimenez laid out for the ball and got a glove on it but he could not hang on. It popped out of his glove allowing Devencenzi to score the go-ahead run. Beck then scored on Hunter Hargrove's RBI single. Nick Highberger (S, 1/1) sent the Nuts down in order in the ninth. The Nuts look to snap their six-game skid and avoid a sweep on Sunday afternoon in the four-game series finale. First pitch against the Ports is at 2:05 p.m. Coverage on ModestoNuts.com will start at 1:50 p.m. Listen live online on your phone, tablet or PC by clicking HERE.